I’m new to the blog and feel it’s important to toss out a disclaimer before I continue: I am unapologetically fat and super great with that. Now, you’re either tossing your hands in the air excitedly about that proclamation with a ‘yassss-girl-on-the-internet-I-don’t-know’ or you’ve hit the X and I lost you and that’s ok too. But boy howdy, am I having a time finding balance between fat, fitness, & fitting it all in. Perhaps sharing about it will help me figure a few things out? I have a desk job in IT and a whole lot of… we’ll call them reasons … that I’m not super active. My employer, however, understands that these reasons are a struggle and does something pretty great to help change that. Working in the world of tech start-ups, it’s not uncommon to find two things especially to be true: really great snacks on site & an incentive to be active. Currently I’m working at a fantastic eCommerce company called Shopify and they’re really good at adding the –ify ending to lots of things, so Sportify as an athletic allowance just makes sense. What didn’t make loads of sense to me initially, however, were the really loose rules around what constituted appropriate spending of this well loved perk. Maybe this is because the previous unnamed IT company I worked for had such rigid ideas around how to spend their active bonus. Many things we talk about and do are labeled and given boxes to live within, so this feels like a great space to deconstruct those ideas and truly consider what constitutes fitness or being active. But I NEED a definition! Ok, ok! But I’m not going to link you to my favourite online dictionary definition or delve into the etymology of the word fitness, so if you need that I’m feeling fairly confident you can use the power of Google to self-serve. With that definition, the one you either already hold in your head and your heart or the one you just took 90 seconds to find, I’m challenging you to also find the meaning of and in fitness that speaks most to your needs right now and not just what you were taught in grade school. The Other Co Gym memberships, some sports clubs, but not golf fees or hockey dues. Basically, we have a list and you’re welcome to ask us to consider your idea. We might say no. * gym membership discounts on top of the Sportify incentive also exist at Shopify! Don’t get me wrong here, both companies offer fantastic incentives and The Other Co actually offers more dollars per year despite the stricter guidelines. Not everyone is into going to a gym and some people really just need a supportive pair of sneakers for early morning walks on the boardwalk. I’m not into the business of comparing my physical activity (as low as it may be right now) with others. My walks on the boardwalk don’t compare to your gazillion reps of things I don’t understand in a fancy elite gym, for no other reason than they are two different things. Is one better than the other? Nope! If two different companies can have such different ideas around how to spend money on helping you be active & fit, I say you can be in charge of your own defining of fitness in your life, too. One of the most difficult things I know that I face as a fat woman, is just how unlikely it is that I will fit within the very design of the box made by The Other Co. Gyms are not a space I feel especially welcome or comfortable in, for example, yet they are the most common way for people to spend the incentives that workplaces offer for fitness. Nobody knows my body better than I do, and I’m telling you this: A treadmill is not what what body wants or needs. If you are invested in parking at the furthest corner of the parking lot to move that little bit more, then I applaud you for doing what you get to include in your own definitions around caring for your body. That doesn’t mean that I compare your outward act of grocery shopping endurance to the person who parks in the spot for people with disabilities or parents of small children. When did it become important to look at the people on either side of us and measure ourselves next to them in some sort of fitness currency, determining our worth based on how many marathons we have completed or how many really large tires we have flipped the length of a football field. What tool are we actually using to place this secret value on activities, that when we compare ourselves against we either feel very rich or as if we have insufficient funds? Can we not decide that, the only true fitness lack is when, by our very own definition, we are not doing the good things our bodies deserve by moving and caring for them? I rather like Shopify’s approach to how I get to be the master of my own ideas around the needs of my body to be active, and happy, and healthy. So whether I spend my annual perk on killer sneakers for cross fit, new paddles for my canoe, some gear for my bike, a yoga ball and meditation CD, tennis lessons, a salsa class, or a hula hoop, I am ultimately deciding for myself what constitutes Sportify. Where is this label in the rest of our fitness lives and how can we apply it positively in a way where nobody needs to feel fitness poverty when reading their friends’ Facebook status updates? As for me? I bought a bike. The first bike I ever owned in 25 years. And I am terrified to ride it, but already it is so valuable to me on our short little journeys together. I plan to find my way with my bike and not once feel poorly about how others are faster, stronger, better, thinner than me. My fitness counts. What about you? Are you feeling rich by your own definition of fitness? Are you able to applaud others for their milestones while also being mindful of your own ride being awesome and entirely unique? I would love to hear about it in the comments below! 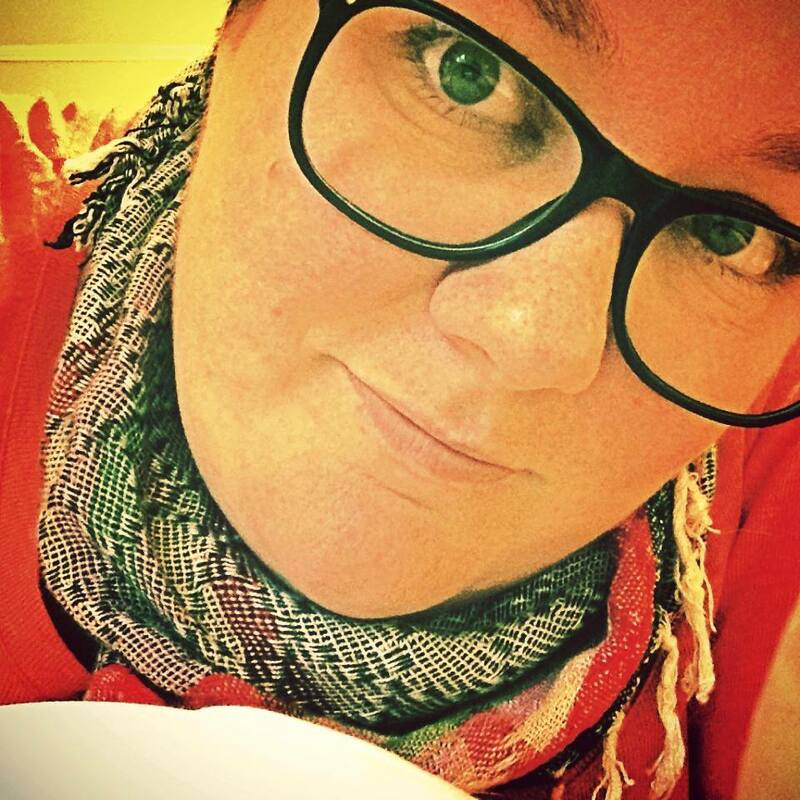 Bio: Queer, Fat, Feminist of intersections. Not so fit, but chewing on the reasons why and the ways to challenge what that means. No apologies for any of it. It’s really pretty! I intended to snap a shot for the post! I’ve only ridden it on a running track in a school yard behind my old place. I’m actually terrified of city streets and with my new address, I don’t have the same safety feels yet. Great to see that you are approaching things your way. We are all individuals and when it comes to fitness need to tackle it personally. In the last year I have challenged myself by getting fitter. I feel healthier, more active in a long time. I am in my 50’s, never been thin, enjoy good food, wine and life. My fitness level is better now than what it was in my 40’s. I’m looking for a better way to approach the things that are important while still holding on to my politics around bodies and shame. It’s so hard! – Nobody can tell you what you should and should not eat. – Food is a pleasure and not a shame. – All of the rules that society dictates I should follow? Especially the ones about food that goes in my face and the size my body should be? I hereby toss them in a waist bin! Gyms aren’t a great fit for me, either. I always feel like : (a) it’s a building made for and filled with people trying not to be me (fat) and (b) it’s too wrapped up in easily quantifiable progress (how far, how high, etc.). Sometimes, the only thing that really matters is the *effort*. Yeah, maybe struggle with doing 20 step-ups, but I’m also carrying more weight and putting in as much effort as the next person. I love, love, love that your employer lets you define your own needs. That’s really fantastic. For years I was terrified of the gym because I didn’t know what to do. Now that I’m a personal trainer I can tell you, I have clients that by western standards “aren’t fit” but they can outperform my “athletic” clients. It’s all about heart, how hard you’re willing to work and how confident you are with yourself. Be happy, get moving, be consistent, eat well, sleep well. People overcomplicate it. It’s interesting really. I don’t give too many flying f-bombs about how people view me BUT I can’t escape the truth that people _are_ looking at me in a gym and I find that really distracting. I also find that people are both less apt to help you if you’re learning a new movement or exercise… and they’re also more likely to speak to you like an 18 month old who just took their first steps. I don’t need skinny, fit people to be PROUD of me for getting on a treadmill, thanks. I haven’t noticed people paying much attention to me (though, that could just be the gym environment I last frequented), but I have noticed the often condescending tone. It’s very annoying and, frankly, rude. I always got a little spark of glee on the occasions when I surprised with with my strength or whatnot. I quit going to a gym because I didn’t want to set weight loss goals. I just wasn’t interested in weight loss, or in high-intensity training, or in “body transformation,” or any number of other things they were trying to sell me. I decided to do my own thing, and one of those things was hula-hooping. 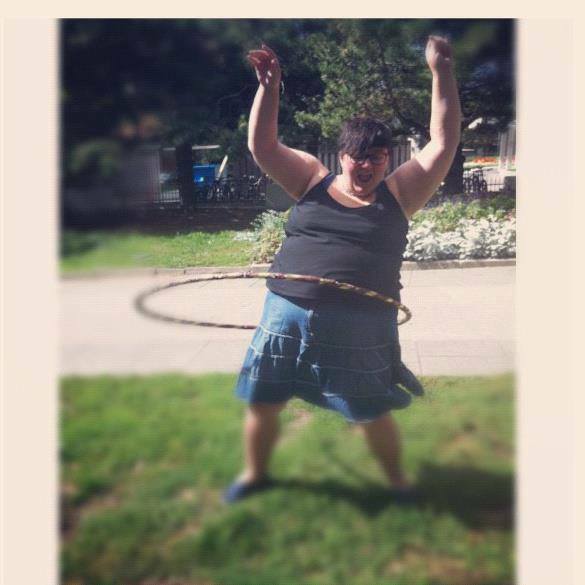 I love your picture with the hula hoop. But I also discovered that hula hooping is hard! It took me several weeks before I could even do it consistently. Yeah, I want a fitter bod, I don’t need it to be smaller necessarily. I’m actually afraid of how that makes my fat politics appear. This is a struggle lots of body positive people face when their size changes in the direction of what society believes is important. If you are active, are having a good time, and keep it up that is all that matters dear! I am blessed to work at a company that provides a gym, a trainer that is not in any way intimidating, and group classes that range so diversely in regards to age and body types. I always feel comfortable and not judged. At gyms however, I have felt judged. It’s not fun! Bravo!! Well written and a great perspective!! But seriously, your new company has a great attitude toward fitness and letting the definition be open to interpretation. I wish I would have gone into IT — sounds like a lot of companies have amazing perks! Fab post! Being empowered and trusted to decide what we need rather than dictates to is a far healthier approach in my view… Far more inclusive and surely the result is everyone is happier… Therefore healthier? Nice.. Sounds long-sighted… I like it! I totally feel you with the fitness competition thing. Every time I go out to do something active I’m comparing myself (unfavourably, of course) – thank you so much for the perspective. Fat people deserve to do athletic things too! Lol. I guess that means my brother must read the blog at least sometimes. And yes, the hot dog was great! I love having lunch there. Such a great vibe.